Shaquille McDonald insists he has no complaints over his limited opportunities at The Shay since joining on loan from Derby. The 20-year-old has made only five appearances for the club since arriving in late November, scoring twice against Tamworth and Gateshead in the FA Trophy, a goals that were followed by a spectacular back-flip celebration. 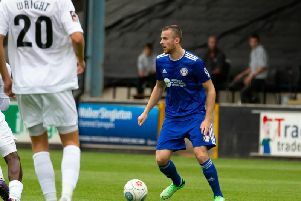 But the forward, who has now extended his loan with The Shaymen until the end of the season, understands why his chances have been restricted. “The lads have been winning games so as long as that’s the case I cant really complain,” he said. “If the team was doing bad then I’d have something to say but you’re never going to change a winning team - if they’re winning games then they must be doing something right. “We were close to the bottom of the league when I came and since then we’ve been on an unbelievable run. “Hopefully they keep that up and manage to stay up. McDonald has still been turning out for the Derby under 21 side during his stint at The Shay, and trains with the Championship club as well as with Halifax. “Every day is high intensity training at Derby and they do a lot of sessions around fitness,” he said. “Everything is at game-pace so when the game’s come around, you’re ready for them. “I do extra stuff on the side as well. “Players do float between training with the senior squad and the under 21s. The Birmingham-born striker is mystified at why Town are involved in a relegation scrap and believes there is a lot of quality in Jim Harvey’s squad. “The training’s alright and the players are very good,” McDonald said. “I don’t know we’re in the situation we’re in. “They had a bad run at the start of the season but the team has really gelled together now. “Obviously I train with younger players at Derby whereas at Halifax they’re a lot bigger and stronger physically. “At Derby the training quicker and more technical, but football-wise its just the same. “The game’s for the under 21s are a lot different, more technical, a lot of balls to feet, quick play, balls threaded through rather than being more over the top in the Conference. “At Conference level you get more target men playing up front, more physical battles.